Updated recommendations lower the blood pressure threshold for a hypertension diagnosis from 140/90 to 130/80 mm Hg. Newly released guidelines from the American Heart Association and the American College of Cardiology lower the blood pressure (BP) cutoff for hypertension diagnosis from 140/90 mm Hg to 130/80 mm Hg. The term prehypertension is no longer recommended. 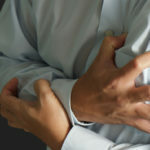 Instead, stage 1 hypertension will refer to levels of 130 to 139 mm Hg systolic or 80 to 89 mm Hg diastolic pressure; 120 to 129 mm Hg systolic and diastolic less than 80 is considered “elevated.” By lowering the cutoff, nearly half of American adults, particularly the younger individuals, will now be considered hypertensive. For otherwise healthy stage 1 hypertension patients, lifestyle modifications – such as a reduced-sodium diet in line with the Dietary Approaches to Stop Hypertension (DASH) study eating plan as well as exercise and stress reduction – could be the initial approach rather than immediate medical therapy. Patients with stage 1 hypertension, however, who are at higher risk for a cardiovascular event, such as individuals with chronic kidney disease (CKD) or diabetes, should be treated with medication. Patients with CKD or diabetes need to target blood pressure below 130/80 mm Hg. To slow kidney disease progression, patients with advanced CKD or stage 1-2 CKD with macroalbuminuria could be started on an angiotensin converting enzyme (ACE) inhibitor or, if intolerant, an alpha receptor blocker. When resistant hypertension is suspected, clinicians should screen for contributing conditions beyond CKD and albuminuria, such as sleep apnea. New ACC/AHA High Blood Pressure Guidelines Lower Definition of Hypertension [news release]. American College of Cardiology, November 13, 2017. Rubenfire M. 2017 Guideline for High Blood Pressure in Adults. American College of Cardiology. November 13, 2017.